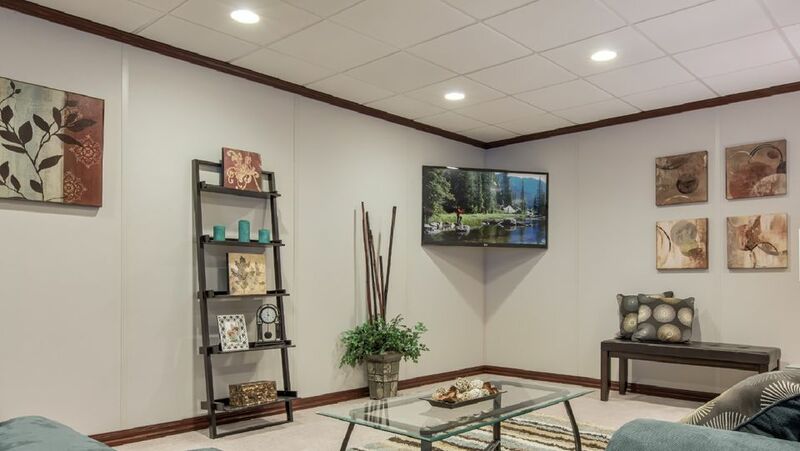 There are many reasons why finishing a basement to add living space is a good idea. In the never-ending search for more living space, converting space that is present within the existing footprint of your home is almost always preferable to the large investment of actually adding a room addition. On average, finishing a basement costs 1/3 to 1/2 the cost of adding a comparable amount of square footage through a structural room addition. And a finished basement is one of the few major home improvement projects that returns a large amount of equity to the value of your home. Not only do you gain valuable living space for your family, but you may recoup as much as 75 percent of the remodeling cost in added equity when you sell your home in the future. According to Remodeling Magazine's annual Cost vs. Value Report, a basement remodel, upon sale, returns a high percentage of the money invested. So, a basement remodels that costs $61,011 might bring back $44,467, or around 72% when you sell the house. This puts a finished basement near the top of the list, just behind an expanded kitchen or added bathroom, as a home improvement that adds value to your home. Ceilings are sometimes quite low. Masonry walls can be difficult to finish in traditional fashion. Basements are often dim, with small windows and insufficient natural lighting. Below-grade environments are susceptible to moisture and humidity problems. Basements can be finished with custom-built work that solves many of the issues with basements. For example, egress windows can be added to improve lighting and offer emergency escape options. Walls can be furred out to provide stud cavities for adding insulation and wiring. But another way to address some of the difficulties with finishing a basement is to turn to one of the commercial basement finishing systems now available. There are variations between these systems, but they all seek to simplify and address some of the most common problems with basements. Typically, these systems use prefabricated panels that are attached directly to masonry walls. The panels offer good insulating value and can be channeled to hold electrical wiring and outlets. Some systems also offer suspended panel ceilings to quickly finish off the ceilings in a basement. Some (not all) also have flooring options. With most of these systems, you are purchasing both the materials and installation as part of the package, so there is little you need to do. The Owens Corning company, well-known makers of home insulation products, offers the best-known and most popular basement finishing system, which goes by the official title of the Owens Corning® Basement Finishing System™. This is a ready-made, installer-driven package that will completely finish off your basement with walls and ceilings, usually within about two weeks. You will do nothing except write the payment check. The core of the system consists of insulated wall panels. Because it is known as an insulation manufacturer, Owens Corning leans heavily on insulated wall panels for its basement system. The wall panels are available in both paintable versions and fabric-covered. The wall panels offer an insulating value of R-11, and because they include no organic materials, mold and mildew are not a problem, as they are with drywall. The panels are 1-inch and 2 1/2-inch-thick glass fiberboard, a sturdy type of insulating material (not fluffy fiberglass insulation). This panel is covered with an even harder facing made of acrylic and Teflon that is both paintable and washable. This system also comes with finished ceilings, which consist of suspended acoustic panels. However, there is no flooring option with the Owens Corning System; you'll have to plan and install flooring yourself at additional cost. Ceiling lighting is also included with this system, as part of the ceiling installation. Both wall and ceiling panels are removable, allowing you access to wiring and mechanical systems, should it become necessary. The Owens Corning system cannot be purchased ala carte and installed yourself. Only franchised installers can handle and install the system components, and your project will be an all-or-nothing affair. After one or more meetings with a sales representative—which can often be high-pressure pitch—contracts are signed and an installation crew will show up at a later date to completely finish the walls and ceilings, a process that usually requires about two weeks. The advantage of this installation model is that you will emerge with a fully finished basement (minus a finished floor) in a relatively short amount of time. The main disadvantage is that you must work with an approved franchised sales-and-installation company, in which pricing can be difficult to understand. Typically, costs for an Owens Corning Basement Finishing System runs between $50 and $70 per square foot. This number is fluid due to many factors—a reality that some homeowners find annoying. For one thing, you are dealing with commissioned salespeople who have the power to adjust figures. For another, all spaces are different. The complexity of the layout and overall dimensions may affect the per-square-foot price. The cost per square foot will vary depending on the dimensions of your basement and the custom work that you have done. For example, one large square or rectangle shaped room is less per square foot, but a design with multiple rooms and more interior walls will be more per square foot. Also, some basements have more obstacles like duct work or mechanicals that need to be boxed in to create finished space. And of course, more custom options can add cost. Azer further suggests that the best way to find a true "per square foot" cost would be to contact a local franchise. The wall panels are mold and mildew-resistant, a good thing in these moisture-prone environments. The wall panels a good R-value (insulating value) of R-11. The wall panels and ceiling can be removed if you need to access the plumbing, electrical, or other services behind them. Since basements tend to have a high concentration of pipes, wires, and other utilities, this is an important thing. The walls are "breathable," allowing for air and moisture to flow in and out. Your basement will be completed in a short amount of time—usually about 2 weeks. The vertical battens separating panels are PVC moldings. These are the plastic strips that cover the seams between the wall panels. So, you will not have perfectly smooth and seamless walls with this system. Some people find the appearance of an Owens Corning basement to be somewhat cheap when compared to a custom-finished basement. The ceiling is a suspended or drop ceiling using acoustic panels, considered by many to be inferior to drywall. The system includes no flooring; arranging for separate flooring adds to the overall cost of the basement. Sales representatives are sometimes known for high-pressure pitches. Pricing can be difficult to understand and variable between different franchise firms. Some consumers find that pricing seems to be "made up" in a random fashion. Initial costs often climb as add-ons and adaptations become necessary. The system is fairly expensive. Costs of $70,000 or more have been reported for large basements fully finished with this system. The high cost does, however, give you a very quick finished basement. Like other basement finishing systems, the Owens Corning Basement Refinishing System will give you a nicely finished basement in very short amount of time. The system also solves some of the most common problems with finished basements, including insulation, mildew, and mold. But the system is somewhat expensive and does not provide the same elegance that is possible with a custom-finished basement completed by a good carpentry contractor.